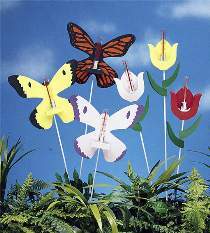 Colorful butterflies and tulips hold our rain gauges. FULL SIZE patterns for both the butterfly and the tulip. Order rain gauges and stems separately.